Big-ticket defence deals are rarely based on technical merit alone. The French-built Rafale isn’t the first – nor will it be the last – aircraft to be picked for geopolitical or strategic reasons. When diplomatic hardsell failed, did France and Britain choreograph the air war on Libya to showcase their aircraft in a bid to influence India’s decision on the fighter aircraft deal? Let’s not get outraged here. For the West, war is a small price to pay if it can help win some orders for their beleaguered companies. After all, there's no better hardsell than real combat. The air war over Libya lasted nearly three months. This despite the entire resources of NATO coming into play against a tiny country of just over six million people. In fact, it came to a stage where NATO ran out of ammunition and Qatar had to open up its armoury for the Western air forces. The prolonged war served two purposes. One, surgical strikes on Libya’s cities destroyed bridges, roads, communication services, schools, hospitals and entire blocks of Government offices. A former defence export official with a NATO country agreed. “As soon as an aircraft or weapon is used on operational deployment, that instantly becomes a major marketing ploy; it becomes 'proven in combat'," he told Reuters. The Libyan operation marked the combat debut for the Typhoon. 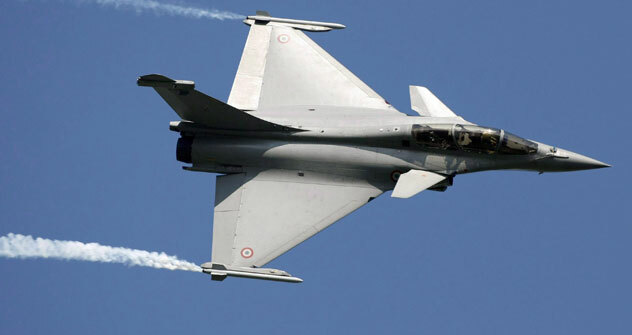 Both the Rafale and Typhoon pounded Libya day and night, a mission that led to the deaths of hundreds of civilians and destroyed infrastructure on a major scale. You have to admit it is a neat little game: destroy-occupy-rebuild-bill. What was being played out in Libya was a Kafkaesque saga – French Rafales bombing the Libyan Air Force’s French Mirages, which French President Nicholas Sarkozy had agreed to modernise. And the Typhoons had just a year before the war, taken part in a Libyan air show attended by Muammar Gaddafi’s generals. According to TIME magazine's Battleland blog the Indians were watching NATO’s Libyan operations with interest. That, however, is debatable. The IAF wouldn’t really care about data on the heroics of Rafale and Typhoon pilots against a defenceless city. There simply was no other reason for bombing Gaddafi. The late Libyan leader had patched up with the West in the recent past. He had handed over the blueprints for a rudimentary nuclear weapon sold to him by the Pakistanis; paid hundreds of millions of dollars to the families of the Lockerbie victims; and signed major defence deals with the same countries that later bombed his country. So why couldn’t they go ahead and sell Rafales and Typhoons to Gaddafi? Well, how many planes could he have bought? Ten? Twenty? Not more. The Indians may end up buying up to 186 – worth nearly $17 billion. That’s enough to keep the French armaments industry humming for a decade. So did India make a costly mistake? Only someone with blinkers on would say the Rafale is unworthy of being conducted into the IAF. The highly professional IAF (which operates over 700 aircraft and is the fourth largest air force after the US, Russia and China) had listed 600 parameters during the selection process, with 590 being the pass mark; anything less than that and the Rafale would have been shot down. Some commentators have argued that by handing over the contract to a geopolitical lightweight like France, India lost a huge opportunity to secure strategic benefits from the US. But this argument has no legs. According to Jane’s Defence Weekly, India will splurge $80 billion on defence imports over the next five years. At a time when unemployment and hunger are widespread in the West, India’s huge civilian and defence markets are cushioning Western companies from a hard landing. Therefore, India doesn't have to keep America happy; rather Washington will have to learn the art of being on good terms with New Delhi. At any rate, the US has bagged several mega deals from India – the C-130 Super Hercules, C-17 Globemaster and P-3 Orion – and a troop landing ship. Russia has also got huge orders for corvettes, frigates, destroyers, a N-submarine, an aircraft carrier and the fifth generation T-50 stealth fighter-bomber. So the big two have little to complain about. There are some who say India should have gone for the F-22 Raptor or the F-35 Lightning. Failing that, India should have gone for the MiG-35 or Typhoon. A few problems here. First up, the Raptor’s export is banned by US federal law. There is no way the US can sell it outside even if it wanted to. Besides, at $412 million each, it is a horrendously overpriced aircraft. For every hour it is in the air, the plane spends more than 30 hours in maintenance. The US Defense Department says an average of just 55 percent of the deployed F-22 fleet has been available to fulfill missions guarding US airspace. And we are talking peacetime missions. Incredibly, America's premier air superiority fighter, which has been in service since 2005, has never been flown over Iraq or Afghanistan. The Project On Government Oversight, a nonpartisan independent American watchdog, has rubbished the US Air Force's claim that the F-22 will "have better reliability and maintainability than any fighter aircraft in history". "More procurement of the F-22 isn't smart strategically or financially,” it says. Another myth floating around is that the Rafale will fare poorly if it goes into combat against the F-22. However, the question of an encounter with the Raptor does not arise simply because the Raptor is stationed for the defence of the continental United States. Last heard, India had no plans to invade America. The F-35 Lightning, a stripped down version of the F-22, is still several years away from delivery, and is currently facing a range of problems, including potentially crippling design, power and range limitations. Plus, it has a long line of – mostly unconvinced – customers, including Israel, South Korea, the UK, Japan, Italy, Spain and even Australia; India can’t hope to jump the queue. At any rate, the Russian T-50 (with some Indian inputs) will be superior to the F-22 so the IAF doesn’t need an interim stealth fighter. Certainly not the poor man's F-22. A true dogfight duke, the MiG-35 should have aced the test. But it failed to make it because it isn’t a new platform, based as it is on the MiG-29 of which India has several squadrons. The Russian plane, despite all its proven abilities, never really excited the IAF. Plus, with 70 percent of its fighter planes being of Russian origin, the IAF was keen on a Western fighter, just to have some balance. Call it a case of aviation deja vu. The Typhoon made it to the finals but is embroiled in bribe scandals in every market it has entered – Saudi Arabia, Czech Republic, South Africa, Romania and Tanzania. It is alleged the Brits had a multi-million pound "slush fund" offering bribes to members of the Saudi royal family and government officials. Under these circumstances, the Rafale, which means gust in French, seems like the perfect choice. The contract has a 50 percent offset clause built into it. Which means the deal will bring $8 billion in French high-tech into India’s defence production sector. Complete transfer of technology is mandatory so cutting-edge knowhow can be transferred to India’s own advanced fighter programme. Dassault was prepared to down the shutters of the Rafale plant if they had lost, so right now they are over the moon. “We have waited 30 years for this,” said a visibly relieved Sarkozy. In fact, the French will now be more than happy to transfer the Rafale’s full technology suite to India, and perhaps throw in the Eiffel Tower, too, for good measure. Also, the IAF’s fleet of 51 French made Mirage 2000s boasts an impeccable safety record over the past 30 years. They are likely to serve a further 15 years after an upgrade. Clearly, the French can be trusted to supply a decent aircraft. Rakesh Krishnan Simha is a New Zealand-based writer. He has previously worked with leading Indian publications like Businessworld, India Today and Hindustan Times.